11 May 1912: Entered the Army as a Fahnenjunker in Infanterie-Regiment Freiherr von Sparr (3. Westfälisches) Nr.16. 8 June 1914: In the field with 4. Lothringisches Infanterie-Regiment Nr.136 as a Platoon Leader. 20 August 1914: Leader of the 7th Company of Infantry Regiment 136. 4 November 1914: Severely wounded/in hospital. 1 August 1915: Company Leader in the II. Replacement Battalion of Infantry Regiment 136. 1 July 1917: Ordnance Officer on Staff of the 64th Landwehr-Brigade. 1 March 1918: Adjutant of the 84th Landwehr-Brigade. May 1919: Court- and Sports Officer in Volunteer Infantry Regiment 36. 1 October 1920: Transferred as a Platoon Leader to the 1st Company of Infantry Regiment 15. 1 March 1924: Hauptmann on Staff of the I. Battalion of Infantry Regiment 15. 1 July 1924: Hauptmann on Staff of the III. Battalion of Infantry Regiment 15. 1 October 1926: Chief of the 16th Company of Infantry Regiment 16. 1 March 1927: Chief of the 11th Company of Infantry Regiment 18. 1 October 1935: Commander of I. Battalion of Infantry Regiment 58. 26 September 1939: Commander of Infantry Regiment 216. 1 April 1940: Sick – Führer Reserve in the Army High Command. 6 September 1942-27 September 1942: Delegated with the leadership of the 95th Infantry Division on the Eastern Front. 1 October 1942-19 July 1943: Commander of the 262nd Infantry Division on the Eastern Front. 1 August 1943: Führer Reserve in the Army High Command. 1 November 1943: Higher Field Commandant 672 and Commandant of Brussels, Belgium. 15 December 1944-11 May 1945: Commander of the Replacement Division “Bielefeld,” later renamed Division Nr. 466 (in existence since 23 November 1944 and also known as Division “Karst,” Battle Group “Karst” or the 466th Division). 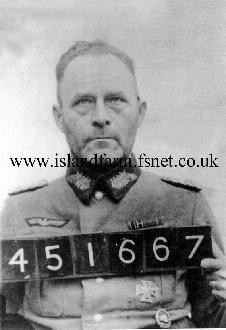 11 May 1945-15 October 1947: Prisoner of war in British captivity. 10th October 1947 to Hamburg on the ship "El Nil"
Knight’s Cross of the Iron Cross: 28 August 1942, Oberst, Commander of Infantry Regiment 461. German Cross in Gold: 14 February 1942, Oberst, Commander of Infantry Regiment 461.